You know the global economic growth rate that’s stuck around a soft 3%? Well, they have the solution to goose it higher. What the world needs now are higher oil prices. Goldman now tells you that higher fuel costs for businesses and consumers are actually good for global growth. 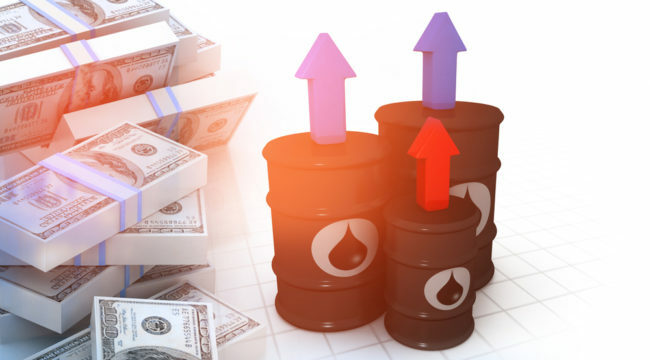 According to Bloomberg, Goldman’s analysts believe that pricier crude oil means economies like Saudi Arabia’s will take in more money than they can spend. This excess will trickle down through the financial system to the rest of the world. Supposedly this will lead to more financial liquidity, lower interest rates, higher asset values and greater consumer confidence. It’s the biggest commodities dealer in the world. Higher oil prices are boomtown to its core business of commissions. That’s why it’s hoping its recent “forecast” for an increase to $55 per barrel becomes a self-fulfilling prophecy. Are you starting to see how this game works? Come out with a bold, self-serving call based on convoluted logic and presto, you’ve established the new market-direction narrative. Higher oil prices are now good for the economy and are to be expected per the “experts” at Goldman. And the talking heads play right along. Goldman’s recent oil call was all over financial media. Remember, this is the same Goldman that predicted oil was going to reach $200 a barrel in 2008, right before it cratered from $150 barrel to $40 during the financial crisis. It’s the same Goldman that predicted oil would be at $90 in the first quarter of 2015, when it hit $44 per barrel. And it’s the same Goldman that just six weeks into 2016 abandoned five of its six recommended top trades for the year because they were based on forecasts that, how shall I say this, bombed. But should we not look to past predictions to judge their skill? Immaterial! That’s water under the bridge. Now you should trust them. Look, higher oil prices sound great if you’re in line for an annual bonus from Goldman or you’re an OPEC insider. You know the guy. He just elected Trump. He has less than $1,000 in the bank. He lives paycheck to paycheck. He’s seen his wages stagnate year after year. And he’s been decimated by zero interest rates. So his most obvious out-of-pocket cost goes up with higher fuel costs and somehow that’s good for him? The extra billions that the Saudis take in will somehow trickle down to him? Give me a freaking break. None of this adds up. The smell test fails immediately out of the gate. There’s a huge disconnect from what’s he’s being fed from Wall Street’s “set the agenda” machine and the media lap dogs and what average people know to be true. It’s what’s known as cognitive dissonance. But that’s how the system works. It’s how the system stays rich and keeps power. Higher oil prices are now good for economic growth per the vampire squid that is Goldman Sachs, whose bloodsucking tentacles engulf anything to do with making money for itself. And the media parrots the bunk as reality… as fact… as gospel. But for the average worker in the U.S., it’s another shiv in the back as he battles for survival. Keep in mind how the game is played the next time you see the big, bold prediction by a Wall Street powerhouse with conflicts of interest as far as the eye can see. These narratives are not being offered up for your benefit, nor will they end up serving your interest. Know what the headlines are designed to do… and follow the trend. That’s how you stay sane, solvent and still have the chance to produce some real wealth. Please send me your comments to coveluncensored@agorafinancial.com. Please tell me exactly what you think of today’s issue.